It appears from a number of emails I received that I have slighted the Mighty Florida State Seminoles by not covering their “epic” win over Brigham Young University in Monday’s weekend wrap-up. That certainly wasn’t my intent, I assure you. 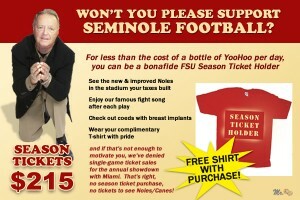 Defending the Seminoles against the dictatorship of the NCAA? Wasn’t I the only college sports writer that defended the institution of higher learning known as Florida State University when the NCAA mascot Nazis demanded the Seminoles change their mascot..
Have I not promoted Chief Osceola and Renegade as one of the greatest mascots in all of college football? Did I not produce a “Special” week of College Football Picks “just” for Florida State fans a few years ago? The Seminoles had been unable to sell their allotment of tickets for home games. Well that just breaks my heart. So please accept my humble apology Seminole Faithful. You thrashed a team that has not been of any national importance since 1984. Seriously . . . what are you drinking? Remember, I live in Vowel country so you should share!!! !